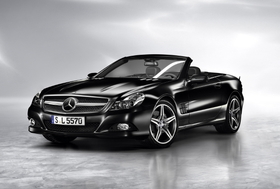 The Mercedes SL will get carbon fiber parts starting in 2012. TOKYO (Reuters) -- Daimler AG will jointly develop carbon fiber car parts with Japanese textile maker Toray Industries Inc., the supplier said Wednesday. The parts will be used on Daimler's Mercedes-Benz cars starting in 2012 with the SL class, Toray spokesman Yoshitaka Yamagata said. Daimler rival BMW AG formed a joint venture last October with Europe's sole carbon fiber manufacturer, the SGL Group. The partners will make carbon fiber parts in Germany and the U.S. state of Washington for BMW's so-called Megacity Vehicle electric car, which is due to launch in 2013. Carbon fiber is a lightweight, durable but expensive material that premium automakers are turning to make their cars lighter. Weight savings from use of carbon fiber in the Megacity nearly compensate for the extra weight of the electric vehicle's batteries, BMW sales boss Ian Robertson told Automotive News last week. The material also has excellent crash safety characteristics. Toray and Daimler will develop reinforced plastic materials by using the carbon fiber produced at Toray's plant in France, he said. This is the first time that Toray, the world's biggest maker of carbon fiber with a global market share of 34 percent, is developing carbon fiber car parts. The company has supplied carbon yarn for Ferrari's sports cars, Yamagata said. Carbon fiber for use in cars accounted for an estimated 7 billion to 8 billion yen ($86 million) of Toray's revenue which is estimated at 1.35 trillion yen for the year ended March 31. Shares of Toray jumped 2 percent to 555 yen (about $5.90) on the news, outperforming a 2.8 percent fall in the benchmark Nikkei average.